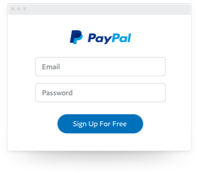 Whether it's for a job done or item sold, with PayPal, all you need is your customer's email address to request a payment. Not a business? Go to our Consumer page. Log in to your account and click on Send & Request in the top navigation. Pick Request from friends or customers and enter your customer's email address. Enter the payment amount, send it to your customer and wait to get paid! 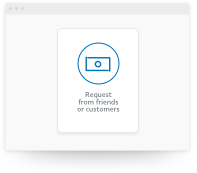 Send a payment request with your customers' email address and they will get an email notification. They can either pay with a PayPal account (if they have one), bank account or with their credit or debit card. PayPal's Seller Protection protects you so you can spend less time worrying and more time growing your business. Accept 26 currencies and payment types like PayPal, Visa, MasterCard and AMEX. See the payment in your account instantly when it's paid. Payments are transferred to your local bank account daily. Accept partial payments for deposits and instalments. Get business analytics and reporting. 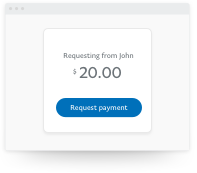 Track and manage payments, and send reminders. Seller Protection for goods and services. Send email requests to multiple recipients at the same time. Enjoy 24/7 fraud prevention and PCI-Compliance. When you sell with PayPal, there are no surprises. You only pay a small fee based on your total sales volume. The more you sell, the lower your fees.